VATICAN CITY (CNS) — Greeting thousands of engaged couples on the feast of St. Valentine, Pope Francis told them not to be afraid of building a permanent and loving relationship in a culture where everything is disposable and fleeting. “The perfect family doesn’t exist, nor is there a perfect husband or a perfect wife, and let’s not talk about the perfect mother-in-law!” he said to laughter and applause. After a week of heavy rains, bright sunshine warmed St. Peter’s Square and the 30,000 people who gathered for an audience Feb. 14 dedicated to couples completing their marriage preparation courses and planning to be married in the church this year. The initiative, “The Joy of ‘Yes’ Forever,” was organized by the Pontifical Council for the Family. The council president, Italian Archbishop Vincenzo Paglia, is a former bishop of Terni and successor to St. Valentine — the third-century martyred bishop of Terni. 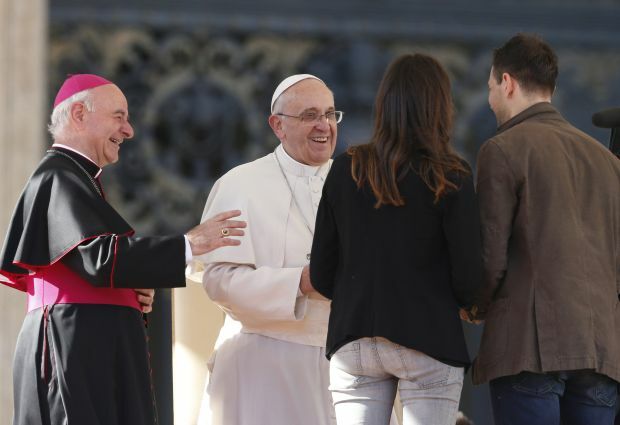 The archbishop told the pope that the young couples in the square were evidence of how many people do want to “go against the tide” by having a love that lasts forever and is blessed by God. Engaged couples attending the audience received a small white pillow with Pope Francis’ signature and his papal crest; the cushion has two satin ribbons for securing wedding rings during the marriage ceremony. While the pope confessed he had the questions in advance and wrote out his answers, that didn’t stop him from straying from the text to give further emphasis and examples. People need to be more attentive to how they treat each other, he said. They must trade in their heavy “mountain boots” for greater delicacy when walking into someone else’s life. 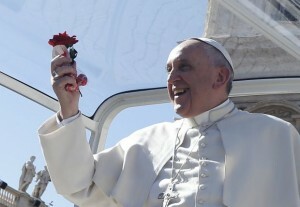 Obviously, couples will make mistakes and fight, but “never, never, never end the day without making peace,” the pope said. An eloquent speech isn’t necessary, he said, but things must be set right because if they aren’t, the bad feelings inside will become “cold and hard and it will be more difficult to make peace” as time goes on. The relationship needs to be taken care of every day, “entrusting yourselves to the Lord Jesus in a life that becomes a daily spiritual journey, made step by step, tiny steps” toward greater maturity and spiritual growth, he said. “They look at each other with the same kind of love they had the day they first met,” she said.